Over the years I have inherited a lot of old photos. In some cases I know who is in them and in some cases I do not. And then there are those where the people are identified and I still don't know how they connect to the family. Randolph Shewan falls into the latter category. I have a copy of an 1880 photograph of this handsome fellow, but who is he? His age is about right to be a younger brother or cousin of Mary Elizabeth Shewan, the first wife of my grandfather's first cousin James A. Buchanan. And the photo was passed down through the descendants of Mary Elizabeth Shewan, which indicates that there is a connection. At familysearch.org I find him in multiple US census records as an adult. But who were his parents? I did some more searching for Randolph Shewan, born 1861 in Utah. This 1870 census record includes a Shewan family that seems to fit our Shewans. Note: M.E. 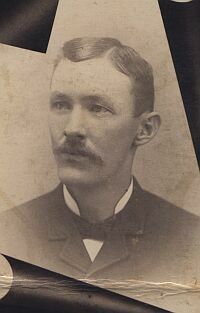 Shewan who is born in Pennsylvania in 1856 is probably Mary Elizabeth, who is already known to be born in that time and place, and a J.R. Shewan is shown as born in Utah in 1861, which matches Randolph's known year and place of birth. I also found the death of John R. Shewan, which lists his parents as John R. Shewan and Parthenia Smith. At that time he identified his father as William Shewan and his mother as Mary Taylor. I think this proves, beyond a reasonable doubt, that Randolph Shewan (the handsome fellow in the 130 year-old handed-down family photo) is in fact a younger brother of Mary Elizabeth Shewan who married James A. Buchanan. His full name was apparently John Randoph Shewan, which matches the J R Shewan in the 1870 census, which also lists siblings I was unaware of. Here are some resources I have used for cemetery research. Check nearby plots for other family members. The people in the next plot may be family members or in-laws with a different surname. Many large cemeteries have their own websites that can be especially useful. The more general sites are helpful if you do not know what cemetery someone is buried in. When photographing grave stones, make sure the inscriptions are legible. They are more important than the design of the monument. Check the ground level of the monuments for obscured writing. Check for small secondary markers. Check the sexton records (cemetery books) for additional information. Remember that not all graves have markers. If you have a GPS, you can use it to record the location. Consider photographing the inscriptions and uploading them to findagrave.com or billiongraves.com as a way of helping others, and maybe connecting with others who are researching the same families. Cemetery Finding Aids may help you find a tombstone inscription that gives the year of birth or the names of other family members. Find a Grave http://www.findagrave.com is international in scope, and is one of the most frequented web sites by genealogists. Billion Graves http://billiongraves.com This is a new international site that is gaining a lot of support. David Obee's sites: www.daveobee.com and www.cangenealogy.com allows searches of cemeteries in different provinces. http://www.cangenealogy.com/alberta.html is the Alberta page. The “Master Name List” at the Provincial Archives of Alberta (and at AGS) lists burials in central Alberta.